Welcome to the Fourth Edition of APPS’ “Eyes on the SRC”. Every month, the Philadelphia School Reform Commission votes, with almost no public deliberation, on pages of resolutions that will affect the academic and financial future of the district. Our purpose here is to shine a light on a few resolutions that need to be explained in more detail. We ask questions here which should be asked of the SRC members themselves. That is one reason why we need every voice to speak out against the chaos and turmoil created by this present administration and by the School Reform Commission. School started in September with a dire lack of substitutes, and the situation has not improved. Teachers in every school are losing valuable prep time to covering classes. 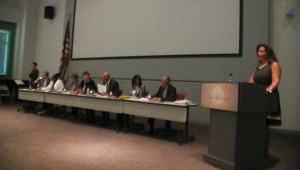 Dr. Hite admits that Source4Teachers is doing poorly, yet he makes no effort to terminate their contract. He and the SRC, which voted to outsource substitutes, need to be called out on this at every opportunity. The next SRC meeting is Thursday November 19th at 5:30. To register to speak you must call 215 400 4180 by 4:30 on Wednesday November 18th. It’s best to say that you’re a teacher, parent, or community member because only “one member of an organization can register to speak” (from the District website).